Tropical Cyclone Trever is expected to sweep across the Cape York Peninsula and out into the Gulf of Carpentaria. Picture: Windy. Tropical Cyclone Trevor has lashed the Queensland coast with winds up to 220km/h at its "very destructive core" and is expected to weaken before developing into a monster system. 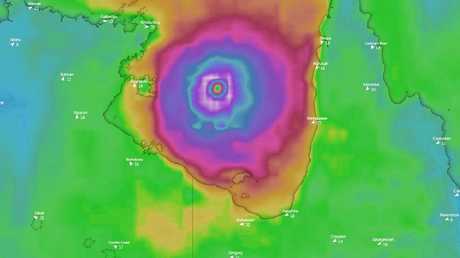 In its last advice, just before 5am Queensland time, the Bureau of Meteorology said the Cyclone 100 kilometres southeast of Weipa and 95 kilometres east of Aurukun. Tropical Cyclone warning has been cancelled between Coen and Cape Melville. But a Cyclone Watch was declared south to Kowanyama. Category 4 storms are classed as "severe" and can lead to significant roofing loss and structural damage, caravans are likely to blown away, dangerous debris can become airborne and power can fail. Isolated gusts can reach 279km/h. 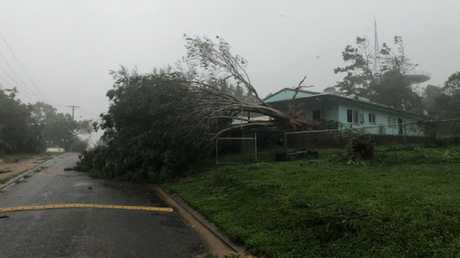 Damage at Lockhart River from Tropical Cyclone Trevor, which is blasting the region with gusts of more than 220km/h. Picture: Supplied. "Check your emergency kit and make sure it's stocked with essential items including food, water, dry clothes, medications, first aid supplies, important documents, valuables, a battery-powered or wind up radio and sleeping gear." 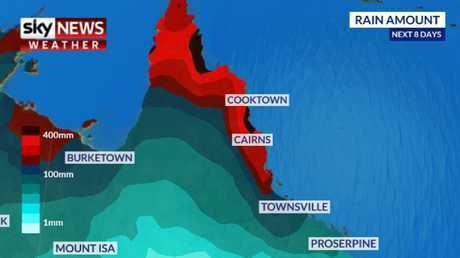 "In Cairns, rain, showers and storms will be heavy at times with a weekly total most likely between 200-400mm. Townsville looks to escape the heavy falls with a weekly total likely to slot between 60-120mm. "As we move through the week that system will move into the Gulf of Carpentaria before re-deepening into a tropical cyclone and then moving into inland areas of the Northern Territory. That's good news for farmers in Queensland and New South Wales who will see extra moisture." 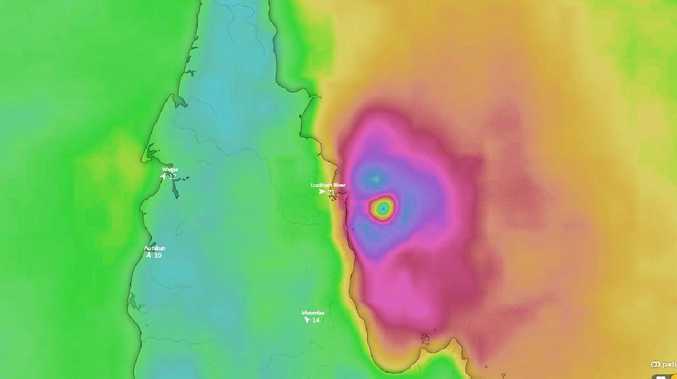 "Due to the strength of Trevor and favourable environmental conditions, the system is expected to re-intensify quickly once it moves over the warm waters of the Gulf of Carpentaria," said Bureau meteorologist Bradley Wood on Tuesday afternoon. 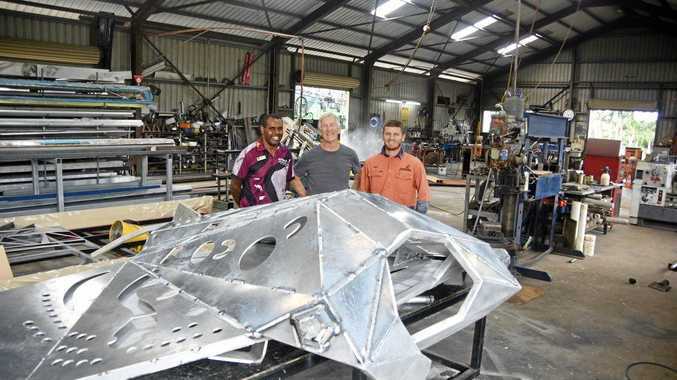 "While it's too early to say exactly where Tropical Cyclone Trevor will cross the coast, residents between Nhulunbuy and the Northern Territory / Queensland border, including Grote Eylandt need to stay on high alert. "Unlike Tropical Cyclone Owen, Trevor is expected to be a relatively large system with impacts felt well away from the centre of the system." The entire east coast could see soggy conditions for much of this week. That comes after parts of Sydney and Brisbane were hit with an entire month's rain over the weekend - sometimes in just a few hours. While southern areas of Queensland may be out of the cyclone impact zone, that doesn't mean the weather is going to be entirely settled. It's far more settled south of the Murray. Melbourne will see pleasant autumn days with temperatures in the mid twenties this week rising to 30C on Friday.